One of the most frequently asked questions I get from Fash readers is advice on appropriate interview attire. How much is enough? Should I go bright and bold or soft and natural? Searching for the perfect ensemble to land your dream job is no joking matter. Since solid pieces tend to be forgettable and certain patterns may be a bit risky, I always recommend dazzling your future employers in stripes. While interning at BCBG, I was forced to become an expert at go-to business chic ensembles and stripes quickly became my savior. Men have been rocking pinstripes in the business world for years... it's high time the ladies add a little fash twist to their working wardrobe with this creative classic. While I wouldn't recommend wearing this to an interview (a great pair of black or white dress pants is always best) this bold Kate Spade skirt (which you can find here) offers the perfect example of how to rock a statement stripe. To keep it bright, I paired my stripes with a blue Guess blouse, my favorite vintage clutch courtesy of garage sale shopping, and a pair of sky high Giuseppe Zanotti pumps, which probably wouldn't be ideal for jobs outside of the fashion industry. A great flat like this would also leave a lasting impression, while not being too high maintenance. When it comes to accessories, keep it light. As a girl who loves to talk with her hands, I always leave the bangles and bracelets at home. The last thing you want to do is distract them with "clinging" noises. A few statement rings like my favorite gold cocktail rings from Posh Locket and Pop of Chic will remind them that you have style without taking the focus away from the dialog! So ladies, the next time you're brainstorming for the perfect interview/meeting attire, remember to go for stripes. Be sure to do research about your future employer to see what type of ensemble reflects their company best. Since not all industries are as bold as the fashion industry, here's a few other ways to get creative with your stripes. It's no secret that I'm beyond obsessed with OPI. Above I paired one of my new favorite combos with my interview attire, the gorgeous plum purple (Dutchya Just Love OPI?) with the perfect gold sparkles (Gold for Me). Check out these OPI colors and more here. Not only is it Nautical but its colorblocked! You never cease to amaze me with your stunning style Anna. 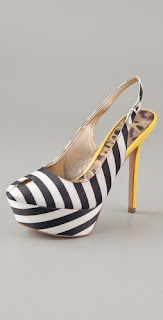 Love the striped choices as well love! Loving the cobalt with the stripes! You have such a great sense in fashion! I love reading your blog! Wow! Great outfit!! I love the blue, the yellow, the stripes! I just love your whole outfit! ohh i love this ouftit! I love your bag, it's such a beautiful colour. Love the colour of that blouse, it's stunning! Great outfit there lovely! Pretty outfit and I really love what you did with the nails! I love yellow with blue!! Your bag and shoes look amazing! I always get asked this question too be readers and I couldn't agree more! I also am pro wearing hair out of your face and keeping jewelry minimal (as I always fidget with things). I am loving this combination! The cobalt blouse looks so good with the stripes, and I always LOVE a bold black & white stripe! The thicker the better! Looking gorgeous here! Love the color combo! So professional and chic! I adore stripes, they're so perfect! Love the yellow accesories ! You look lovely Hun and I love the skirt. You really do know how to put an outfit together. Super cute! I love this look! The added pops of yellow are great. Stunning with the blue and yellow! Very classic and trendy and not overdone. Love the mustard heels, rarely do you see that color. Beautiful! You look beautiful, I love that skirt! And that blue ring is so pretty! like your blog so much! maybe we can stay in contact!!!? Great ideas! I'm in love with the striped blazer in in the Shopbop group. very chic striped skirt!! love the blue-yellow combination!! I love this! I work in DC, where my office is a tad more conservative. Maybe one day I can get away with something so cute! LOVING this color combo!!! i've got a cobalt blouse and striped blazer that i haven't worn yet...you've just convinced me i need to wear them together!!! Cute outfit! I always love stripes! Love your outfit!!! So much color! I love this outfit, so cute! However, I would encourage a disclaimer that interview candidates should do some research into the type of job they are interviewing for and what would be appropriate. Wearing this outfit to an interview in my industry would be a one-way ticket to the Do Not Hire list. Great post Anna! I love OPI as well, they have great blue colors, but I am curntly obsessing over their summerish beige color called "did you hear about van Gogh?" I really like this combo!! And the little accents of yellow really make it fun! That skirt is lovely!! I'm in desperate need for more skirts that are cute and semi-formfitting! hehe! Wow, what a ring Anna! Just love it with the bright colors in your clutch, shoes and blouse. 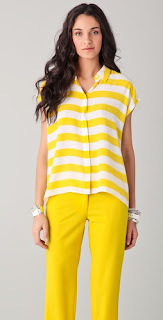 And the way you paired the brights with the stripes, fabulous! Hope your day is going well so far and if you get a chance, I hope you can stop by and see today's DAY style on Wrinkled Chiffon. Happy Monday! Love the nails. I have the gold for me so it looks like that purple will be my next addition! LOVE this outfit. These tips are great. I wish I worked in fashion so I could pull of that skirt at work. You look stunning. great ideas! This outfit is very cute. Love the mustard with stripes :) thanks for sharing, Anna! When you get a second, I'd love to know what you think of my latest post! Oh wow. Those shoes are amazing..hands down. 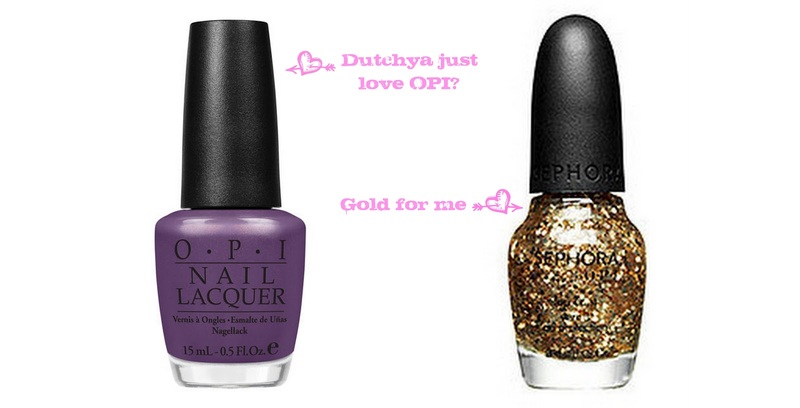 Pretty gold nail polish, too! Hope you have a very amazing Monday! Love this look! The colors and stripes are just perfect. Great advice, and the outfit is adorable no matter the occasion! This is amazing advice and I love the alternatives for those of us in less than glamorous industries. I totally agree with you, researching the firm before hand will help to inform what kind of interview ensemble to put together. Your posts are always amazing and informative. You look flawless and classy as always. Love this look! Super cute striped skirt :) Your mustard yellow heels are also great with the blue top! Gorgeous outfit! Love the bright yellow shoes! I love the stripes idea! The bold colors in your outfit are darling. When I go for my interviews (HR field) I still like to add color to my outfit and not stay so blah and dark because I want to show my personality. I'll wear like one piece of bold color. LOVE this outfit! You are too cute! The clutch and shoes are adorable. would definitely make a statement in these choices at an interview! this look is wonderful! elegant and stylish! This is BUSINESS chic for me, YES!!! I am a stripped kind of girl, so yes, this kind of look I would wear in the Office!! Most of the times I see all your posts but don't comment. You are for sure in my blog readding list!!! 'Kisses from Greece! where is the clutch from? oh em geee your heeels are incredible!!! What a beautiful look, honey.. You looks so chic and stylish! And what a gorgeous pictures! This combination of stripes and blue AND yellow is blowing my mind! I love it! Love this look! The pop of yellow is too cute! CONGRATULATIONS ANNA!! 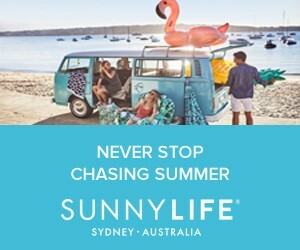 I just saw the announcement from LC.com!! I visit your blog on a daily basis and really, I am SO excited for you!! Great post !! let me be one of the first people to congratulate you on the LC contest!!! choosing one of you two was hard since I follow u both but i m so glad my vote was counted in the winning votes !!! loving the orange and blue combo! Thank you for this! I usually play it safe for interviews, but have recently had a few in the fashion industry and never really know how much is too much. Very helpful and an adorable outfit! you look amazing. This outfit and write up is perfection. verry nice blog,and lovely outfit! 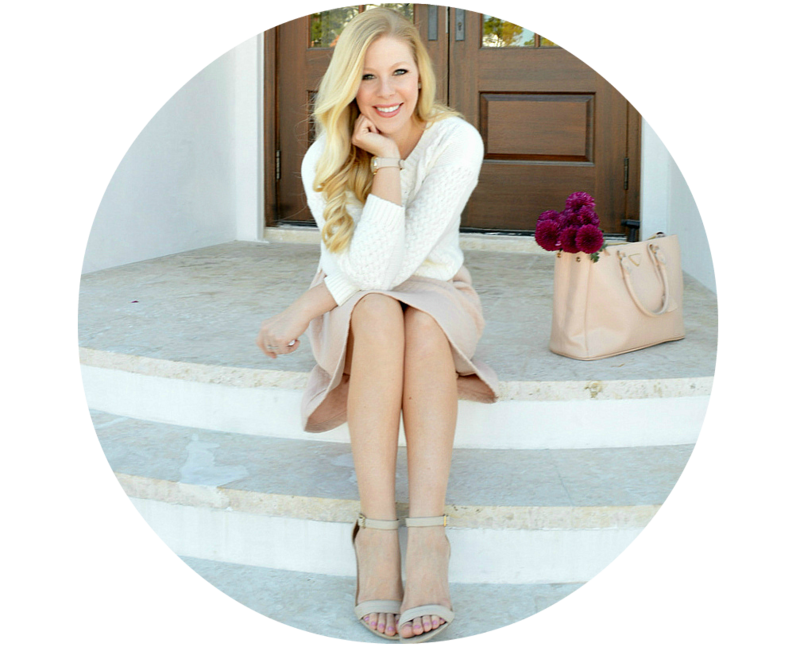 Congratulations on winning the laurenconrad.com blogger contest, Anna! I'm so happy for you and so excited to have found your blog! Love the contrasting pops! Gorgeous look for business cashz...still screams CHIC in every way...great mix hun! Beautiful elegant outfit. Love that blue color on you! Your skirt is amazing. 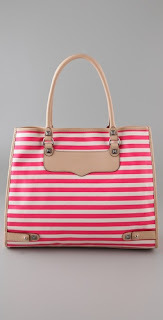 I am so in love with that Rebecca Minkoff tote. Congrats on your win!!!! So happy for you!!! You must be elated! CONGRATULATIONS!! I saw this morning that you won the LC Bloggers competition and I am so happy for you! I voted every time and was really hoping you would win! Love this skirt on you! I don't think stripes look good on me... or maybe it's just horizontal stripes. I am more comfortable with a vertical stripe. I really love the stripey scarf though, that is way cute! And your outfit with the blue top seems so perfect for a job interview and it is definitely something that would stand out in someone's mind and would remember you. I saw Miss Conrad herself tweeted about you winning the blog competition! Congratulations! You totally deserve it! What an exciting experience! Have a great day! I like this skirt! look great on you! Love the pop of color with your blue shirt! I love wearing ruby tones in the summer, because the sun makes the color stand out that much more! I love stripes... Bold yet stylish! This outfit looks great especially with the clutch and heels. I love that shade of blue on you. I wouldn't think to pair a yellow/orange shade with it, but it works perfectly! the outfit is gorgeous! especially the blue and yellow combination; so nice! so u won the competition?! congratulations!!!!!!!! Nice combo. i like how it contrasts and with the pops of color from the shoes and bag looks amazing! you look great, love the pumps and clutch! and well opi is marvelous. I always love how you accessorise! Very cute (and original) interview outfit! I like the advice about researching the company and the company style beforehand, very good advice! I saw on Lauren Conrad's site that you won!! congrats!! you totally deserved it!!! can't wait for your blogs!! Would you mind checking out my blog? I would love to have your thoughts on it! That is a very good advice, thanks. You look absolutely lovely! You look so beautiful. That skirt is amazing on you. I love navy blue and yellow together! Cute outfit!! oh em gee. Love your shoes! that color is so vibrant! Love love love, your look. Reminds me of how creative I had to get when I worked at Aldo. I love the entire look!! This is really cute and chic! Love the stripes! Love the outfit! Those shoes are amazing. I would have never imagined these colors going so well together but you did it. Love how you made the outfit pop with a pair of awesome heels & cute purse...and the color, love it.